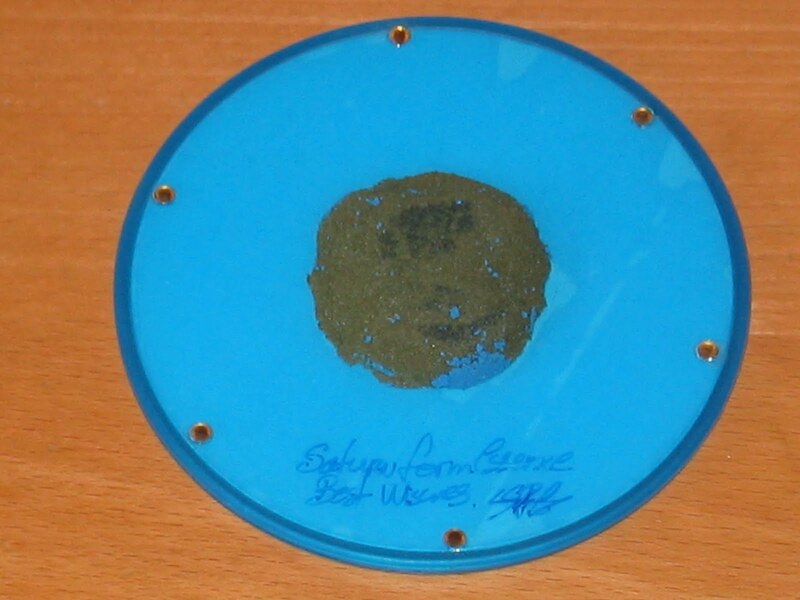 Format: A glittery green 3"CDr housed in a plastic blue 'ufo' case, with 6 yellow 'jewels' positioned around the perimeter. 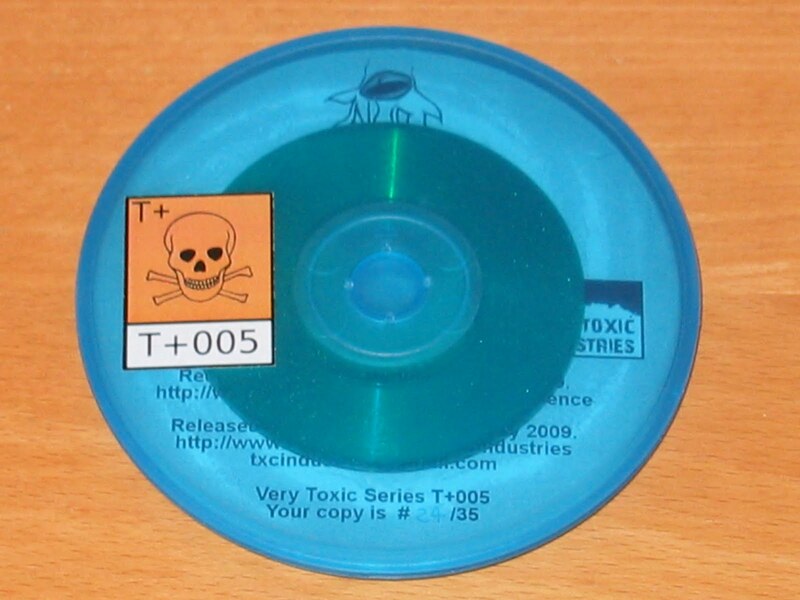 Released in May 2009 by Toxic Industries (Italy) in their Very Toxic Series, cat ref T+005. Inside the release a circular paper inlay shows track details. 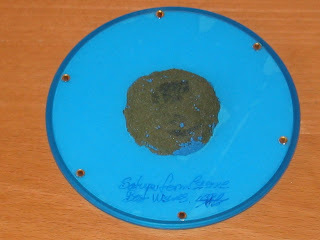 The reverse side of this copy is signed by Saturn Form Essence's mysterious 'S'. Goodness me, it's good to be back. The problem of interstellar travel is the sheer time it takes to get anywhere, but even so who can believe that it's been over two months since we last docked with Voyages Along The Plutonium Path for a look-see at all things Saturn Form Essence...? Well, it certainly has been a good while since the last post, it's true. My apologies. But fear not, for the quantity of releases from this most exciting of Ukrainian ambient/experimental bands has not diminished in my absence, and even as I type a parcel of new releases fresh from the S.F.E. Studio has landed on my launch pad. This particular release, however, is one that's been in the collection for a little while now and is a nice one to get us back on track. A two track release in a distinctly experimental-noise style of fuzzy emanations, swathed in brooding clouds of dust and debris, hurtles across your senses like a comet being slingshot out of the orbit of Saturn itself. Neither track is an easy listen, pounding one's senses like a nebulous grey wall of anti-matter, but it certainly provokes a reaction and that surely is half the battle in creating interesting sounds. 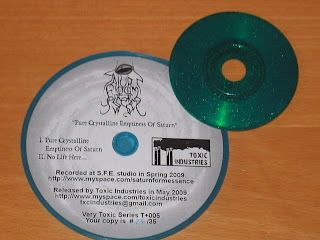 And look at the sympathetic and most excellent packaging but together by Italian label Toxic Industries (http://www.toxicindustries.net84.net/home.php) who have really got it right with the 'ufo' design they deployed on this release. The bulge on the bottom of this particular copy (#24 of 35) has shed most of the original blue paint, leaving behind something vaguely sinister-looking that could very well double for the original single-celled protoplasmic visitor to earth in the 1950s classic "The Blob". The spray painted 3" disc is a suitably alien green still though, and the overall design genius at work deserves a pat on the back.